Graph of y = ex. The exponential function is nearly flat (climbing slowly) for negative values of x, climbs quickly for positive values of x, and equals 1 when x is equal to 0. Its y value always equals the slope at that point. 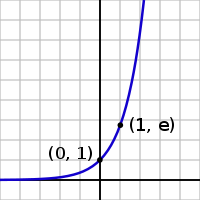 The exponential function is one of the most important functions in mathematics. For a variable x, this function is written as exp(x) or ex, where e is a mathematical constant, the base of the natural logarithm, which equals approximately 2.718281828, and is also known as Euler's number. Here, e is called the base and x is called the exponent. In a more general form, an exponential function can be written as ax, where a is a constant and x is a variable. The graph of y = ex is shown on the right. The graph is always positive (above the x axis) and increases from left to right. It never touches the x axis, although it gets extremely close to it. In other words, the x axis is a horizontal asymptote to the graph. Its inverse function, the logarithm, , is defined for all positive x. Sometimes, especially in the sciences, the term exponential function is more generally used for functions of the form kax, where a is any positive real number not equal to one. In general, the variable x can be any real or complex number, or even an entirely different kind of mathematical object. Some applications of the exponential function include modeling growth in populations, economic changes, fatigue of materials, and radioactive decay. Most simply, exponential functions multiply at a constant rate. For example the population of a bacterial culture that doubles every 20 minutes can be expressed (approximatively, as this is not really a continuous problem) as an exponential, as can the value of a car that decreases by 10 percent per year. defined for all a > 0, and all real numbers x, is called the exponential function with base a. Note that this definition of rests on the previously established existence of the function , defined for all real numbers. The exponential function (blue curve), and the sum of the first n+1 terms of the power series on the left (red curve). In these definitions, n! stands for the factorial of n, and x can be any real number, complex number, element of a Banach algebra (for example, a square matrix), or member of the field of p-adic numbers. The slope of the graph at any point is the height of the function at that point. The rate of increase of the function at x is equal to the value of the function at x. The function solves the differential equation . In fact, many differential equations give rise to exponential functions, including the Schrödinger equation and the Laplace's equation as well as the equations for simple harmonic motion. Thus any exponential function is a constant multiple of its own derivative. If a variable's growth or decay rate is proportional to its size—as is the case in unlimited population growth (see Malthusian catastrophe), continuously compounded interest, or radioactive decay—then the variable can be written as a constant times an exponential function of time. a function ; this grows even faster than an exponential function; for example, if a = 10: f(−1) = 1.26, f(0) = 10, f(1) = 1010, f(2) = 10100 = googol, ..., f(100) = googolplex. Factorials grow faster than exponential functions, but slower than double-exponential functions. Fermat numbers, generated by and double Mersenne numbers generated by are examples of double exponential functions. Carico, Charles C. 1974. Exponential and logarithmic functions (Wadsworth precalculus mathematics series). Belmont, CA: Wadsworth Pub. Co. ISBN 0534003141. Fried, H. M. 2002. Green's Functions and Ordered Exponentials. Cambridge, UK: Cambridge University Press. ISBN 0521443903. Konyagin, Sergei, and Igor Shparlinski. 1999. Character Sums with Exponential Functions and their Applications. Cambridge, UK: Cambridge University Press. ISBN 0521642639. Taylor Series Expansions of Exponential Functions – efunda. This page was last modified on 8 August 2017, at 16:04.